Hey fellow crafty peoples! 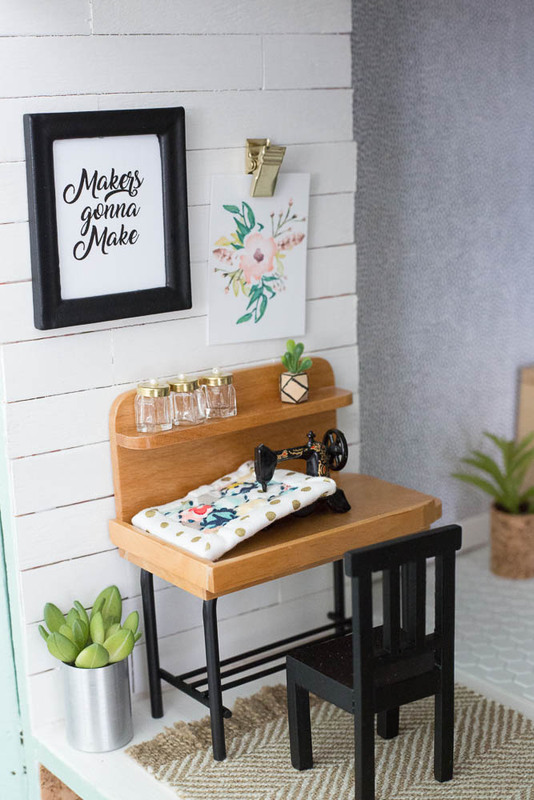 Today I have finally written a post about my dollhouse sewing space! The new one, that is. I LOVE THE NEW ROOM. Let’s just get that out of the way. I started off by installing shiplap over the old stencil, since I needed something to cover it. I didn’t fancy sanding it all down, weird right. It’s just wide popsicle sticks! I cut them to the right lengths and staggered them on the walls, then glued them down with some Loctite. I painted them white and also left the floor white, since I knew I’d add a small rug here. 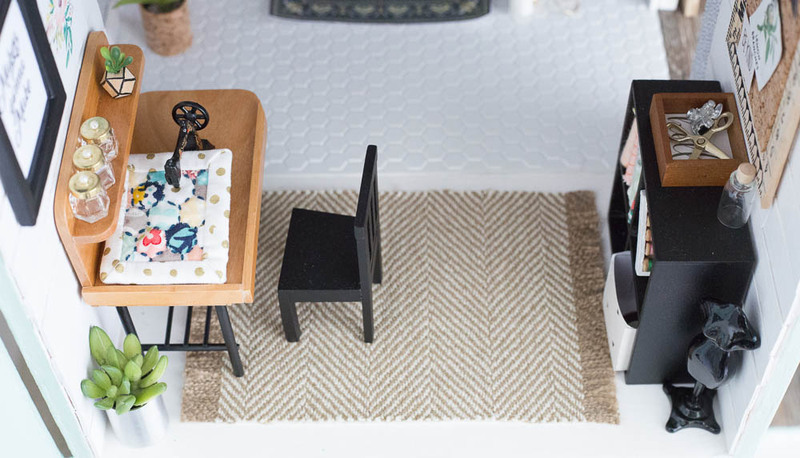 This rug is from the lovely Small Fun Shop over on Etsy! The frame I had on hand, painted it black, and made a quick printable in Illustrator. The floral/feather print was a free printable on Pinterest that I sized down and printed, but apparently did not pin! My bad! The desk is actually a potting table from Miniatures.com (I can’t find it right now, must be out of stock? ), but the colors and size worked perfectly for the room! The sewing machine I had from before, I believe it was from Hobby Lobby? I made the little succulent on the shelf with a small bead, sharpie, and bit of faux plant. The plant on the floor I made with a toiletry lid and also some faux plant! The little quilt in progress on the table was from the first sewing room, sewn for me by Rachel! Alright! Swinging over to the other side, and giving a little sneak peek into the bathroom/master, is another wall of shiplap! I made the bulletin board with some amazing mini ruler pieces of wood that my friend Cassy bought me after she spied me gazing longingly at them. I think it turned out way cute! 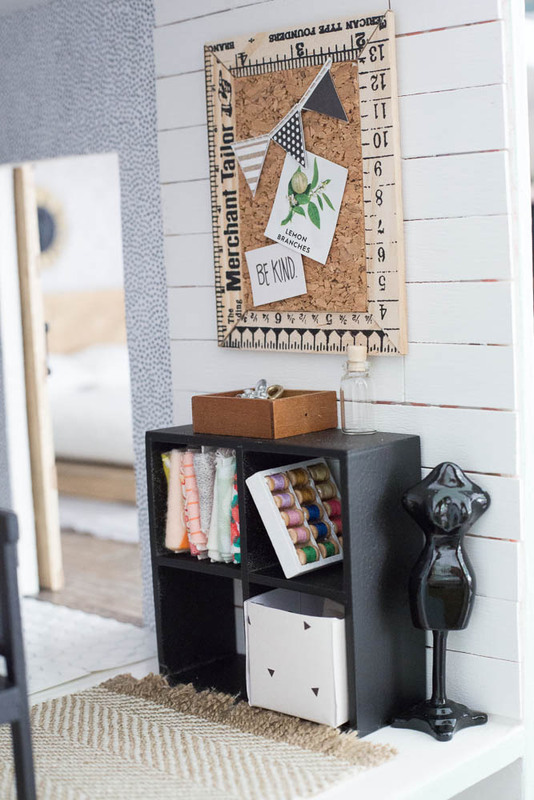 Underneath that I have a little cube storage that I had from the last version of the house, painted black, and with some fabric and thread as well! I also have a mini camera in the wooden box on top, and mini scissors! Here’s the best overall view I can offer, lol! I had so much fun making this sweet and simple room! It’s so lovely, very beautifull !! That is so cute! I love the little corkboard! What’s your method for cutting your popsicle sticks?